How can Steel Bones help me? STEEL BONES is a voluntary charity which works 1-2-1 with amputee families. 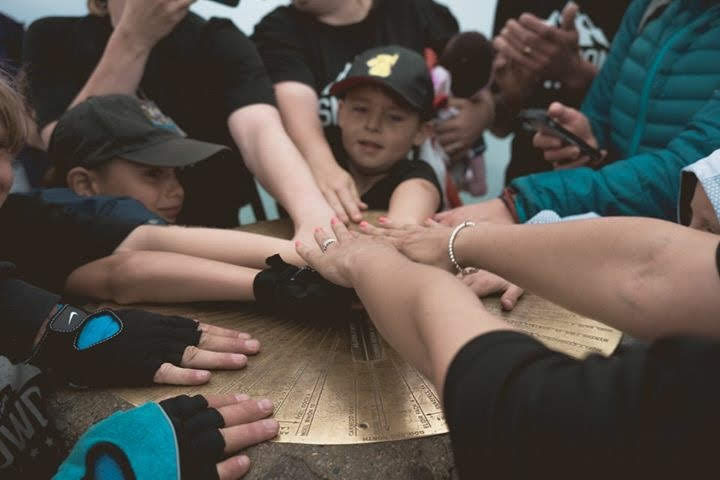 The key focus for Steel Bones is offering support to new amputees and their families – providing the guidance and companionship that they so often need, at an incredibly traumatic time. We represent REAL people, with REAL needs. We are on a mission to improve communication and support amongst all amputees and their families. Our Founder, Leigh Joy-Staines lost his leg 10 years ago due to an operation going horribly wrong. Since the amputation Leigh started a family and they found it incredibly difficult to find support groups, or other friends who understand our situation. It can be a very lonesome disability, and there is a distinct lack of understanding from the general public and government as to how amputation really impacts an individual and their family. 1-2-1 Support for all amputee families new and established. We provide support packs to families upon registering with us, There is no cost just a form to complete: http://eepurl.com/cWJvEP We actively work with NHS Amputee clinics, Trauma, Orthopaedic and Vascular Wards plus local GP and other user services to proactively ensure all amputees are aware of us. The support pack consists of some small treats for each family, every pack is different and designed for the family to make them smile if nothing else. It also includes the Steel Bones Support Brochure with top tips and inspirational messages. This is a resource for amputees written by amputees. Alongside the packs we engage proactively with all families keeping in contact with them if they so wish. Every family is different so when we first meet a family we discuss what challenges they are facing or what’s going really well and we ask them what they would like us to help with. We have a wide range of professional experts we work actively with to provide the best advice and effective signposting for our families. We make regular home visits if the family would like or regular emails or messages. We don’t have a magic wand but we will do whatever we can to help the amputee family overcome whatever they need to. We have a strong social media presence and invite all amputee family members and professionals working with amputees to join our Facebook Group to keep updated with our latest developments. For non facebook users we ensure we email or telephone whichever is appropriate. In order to keep engaging and communicating with amputees and their families, we regularly organise social events such as bowling, indoor skydiving and days out – at the request of some of our amputee families. Our main annual event is the Steel Bones Celebration Day. We have just successfully held our third Celebration Day which saw 250 amputees and their families united for what is now as the event of the year in the amputee calendar. We provide Steel Bones Clubs in the amputee clinics which meet every other month in the amputee clinics so the patients meet the team behind the scenes and we can learn more about the practitioners working to ensure amputees achieve all they need to. Steel Bones hosts a weekly fitness club every week to help amputees with physical and nutritional health. The club has a great vibe and there is strong comradery. The club currently takes place at Inspire Fitness Gym in Mildenhall with their generous support. We are planning to open other clubs as soon as funding is secured. We launched the Cambridge Amputee Football Team with generous support of Cambridge United and Cambs FA. The team trains every Thursday 8.30-9.30pm at Bottisham Sports Centre, Cambridge. 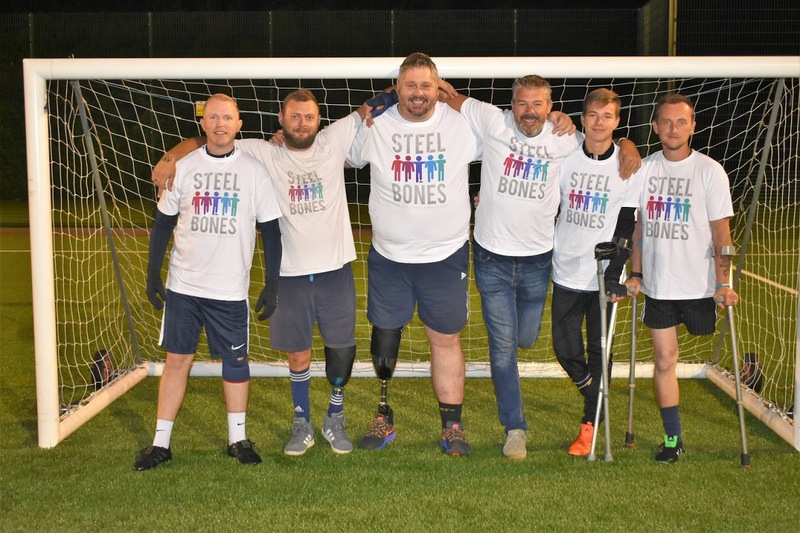 The players have a wide range of ability and it is open to every amputee those who are sporty and those who have never played amputee football before everyone is most welcome. 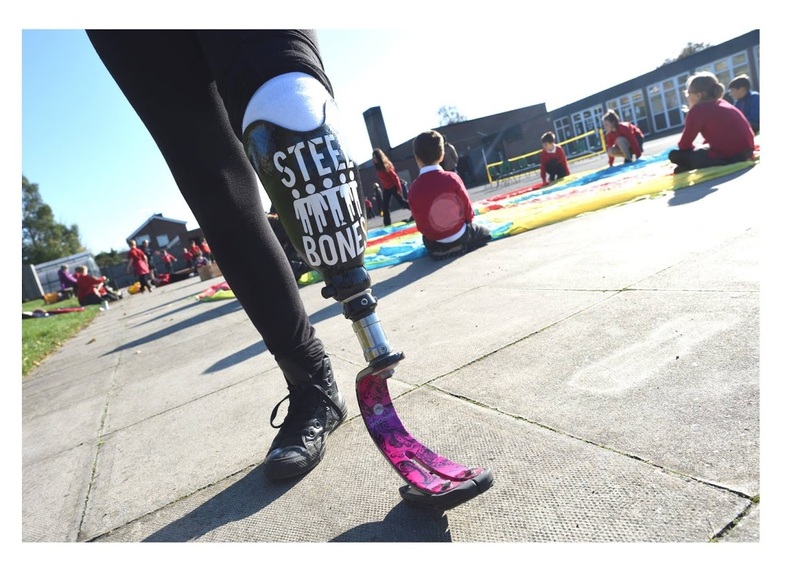 These events, known as Limbitless (Limb-it-Less) games, are delivered in schools and involve an opening talk from a STEEL BONES Ambassador followed by 2 hours of Inclusive sports facilitated by the STEEL BONES sports team and supported by amputees. They are funded by corporate sponsors or local sports funding to ensure there is no cost to the school. Alongside this, we are finalising the first edition of our Children’s Books. 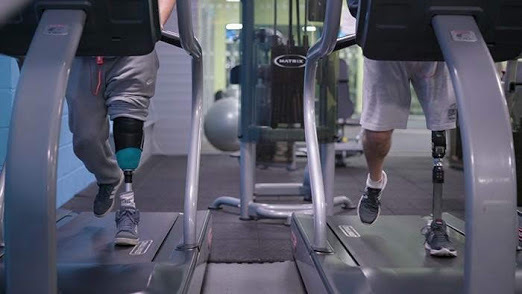 These are stories featuring amputee characters in everyday situations. The books have been created with amputee children and children of amputees along with other school children. These books are the brainchild of our Founder who could not find any books when their Son was experiencing bullying and hard questions from his school friends about his Daddy’s Steel Bone. Steel Bones currently has no overheads so every penny raised goes straight into supporting amputees and their families. We are very excited for the future, and extremely grateful to everyone who has shown an interest and continues to provide generous support. I’ve been an amputee for two years and I would like to help somehow. Hey Rebecca fantastic news, hopefully you have our email? My son Oliver has Syndactyly & Polydactyly. He had an operation when he was 1 to separate the webbing of his fingers on his left hand. He is now 15 & has had ME for almost 4 years. He has not been at school for most of the time he has been ill, so been very isolated. In the past 2 years he has become very conscious of his little hand & hides it most of the time. ( thanks to social media) & they visited him at our home & were asking him about his hand. It was good this happened as I then began to look into what could be done about it if anything, to help Oliver feel better about it. I should explain that we were living abroad when he was a baby & we returned to the UK for the operation which was done privately, when he was 1. We then went back to the Caribbean where we lived. We had to move back to the UK suddenly after losing our roof in a hurricane soon afterwards. I think it was as a result of these circumstances that we didn’t have any follow up appointments or care for Oliver’s hand. We were caught up with relocating our family during an unusual & stressful time. In the last 6 months we have visited 2 different orthopaedic doctors & prosthetics. The prosthetics man we saw last week recommended we get in touch with your charity to get support & for Oliver to meet other people with similar impairments. He is very talented with his music & has composed a great deal over the past 4 years. I look forward to hearing from you & hope you can help support Oliver in some way. I do hope that you have been given details of Reach, the association for children with upper limb difference. This is a fabulous membership charity that offers peer group support. Go to http://www.reach.org.uk or call 0856 130 6225. It is just what you and Oliver need.